Duck farming business in Bangladesh is not only popular but absolutely a lucrative among many other businesses. Also, there is the high availability of duck in Bangladesh and even in the world. And there are various types of duck breeds that well-known for meat and egg production. Wild birds are the source of all the present domestic ducks across the world. As these wild birds wander around the world, some of them have been domesticated as a good source of food. But, mallard species are the dominator of these wild birds. Apart from that, all hen of the world comes from the red wild hen. Although some people think that water is a must for ducks, it’s somehow wrong. However, you can raise ducks without water, but your ducks will lay an unfertilized egg. So, male ducks and water are essential if you want fertile eggs. Ducks need not only less expensive but simple and non-elaborate housing facilities. They need less care or management as they are a very hardy bird. You’ll get fresh eggs from ducks as they lay eggs either at night or in the morning. As ducks grow faster, you need comparatively less space for raising ducks. They are highly resistant to the common avian diseases. Ducks eat a wide variety of foods than other birds. Along with less mortality rate, ducks have a longer life than chickens. Although it looks easy to start a duck farming business in Bangladesh, it’s actually not so easy at all. We’re talking about the commercial productions of meat and eggs of ducks, which requires a lot of capitals. Apart from capitals, it needs well planning with marketing strategies, breed selection, and many more steps. 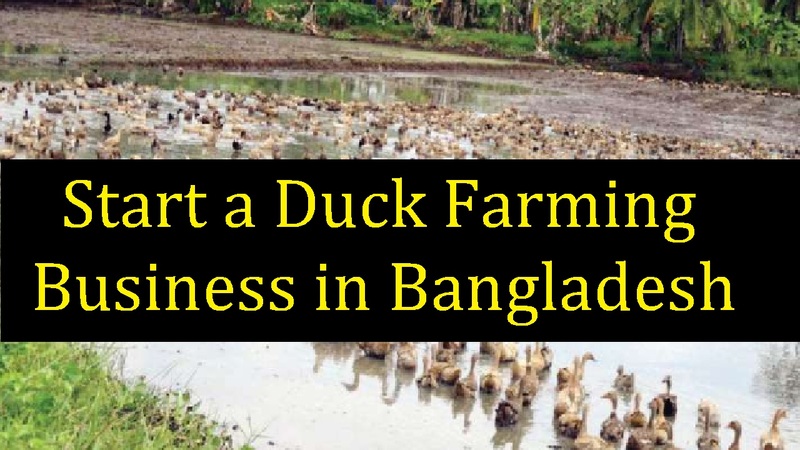 Well, let’s know the steps that require starting a duck farming business in Bangladesh. You’ll find that some duck breeds are suitable for meat production and some others are for egg production. Also, there are some kinds of ducks who are with dual purpose. So, based on your business objective, select the proper duck breed. Below is some different types of duck for you duck farming business. Feeding is the main task of getting better fertile eggs in commercial egg production of duck farming business. According to duck breeds in your farm, you can provide nutritious feed. And usually, duck eats large amounts of food and water than other poultry birds. Depending on the input feed, the number of egg production and the duration of the egg production. Although they can feed on any edibles, you need to provide minerals/salts along with regular diet for commercial egg production. As legume grain feed works very well, the quantity of feed supply depends on breed, bird age, and purpose (egg layers or meat producers). Whether it’s an intensive or extensive raising system, ducks need safe and secured housing. Although you can use the locally available material to build the shelter, you should ensure proper cross-ventilation of the house along with fresh air flow. Not only has a duck required 2 to 3 square feet of floor area, but the house can also be built in high, low, dry and wet areas. As ducks like wet and watery areas, provide both entry and exit points of the house. If you want to keep your duck house secure then you should fence it well. Also, you should build housing floor cemented and keep it deep littering, which should be not less than 5/6 inches. Before sending to the market, they should be cleaned with a soft cloth and stored in egg trays. But, avoid using water to wash eggs. We’re talking about the time when you’re ready to market duck eggs. And place straw at the bottom for cushioning if you’re using any boxes or baskets. If you choose such a cartoon then each cartoon can contain at least 30 eggs. Also, bamboo basket, wooden box and other things for transporting eggs can be used. And you have to be more careful about taking care of ducks, feed management, accommodation, brooding and marketing for making maximum profits from duck farming business in Bangladesh. Besides, you can make a handsome income from this business if all the process is done well. During the brooding period to prevent from wetness, it’s recommended to use of wire mesh floor. But, you must ensure enough pure water is present in the house other than ducks may be sick. At least for 15 days of their birth, don’t allow newborn ducklings into the water pond. Instead, use shallow vessels of water in the house to provide water for newborn. Also, keep your water vessels on wire plant so that you can avoid wet litter on the floor. Moreover, eliminate GNC from the feed content as ducks are more sensitive to aflotoxin. You should avoid overcrowding as you have to provide enough space for your ducks in the house. As ducks don’t mate without water, it’s a must for breeding purpose. For 10 female ducks, 1 male duck is enough for breeding. And at their five months of age, a high quality and productive duck breed start laying eggs. And instead of ducks, you can use hens for hatching the eggs. Sprinkle the eggs with water occasionally (two or three times per week) during the hatching period.